Planning a birthday party? This is the perfect addition to your party! Handmade Korean happy birthday banner 생일 축하합니다 – 7 panels at 5″ x 5½″ with white string. Please give us 1 color of your choice for the background (navy blue in this picture) PLUS 2 colors of your choice for the letters (mint and turquoise in this picture). The text will come as shown (black lettering on white circle). If you would like this banner but in a different design that you find in my shop feel free to message me. Had such a great experience with this shop! They really listened to my wants and the banner and custom T-shirts and everything came out great! Can’t wait for my baby’s party!! Nativehaus was amazing to work with. 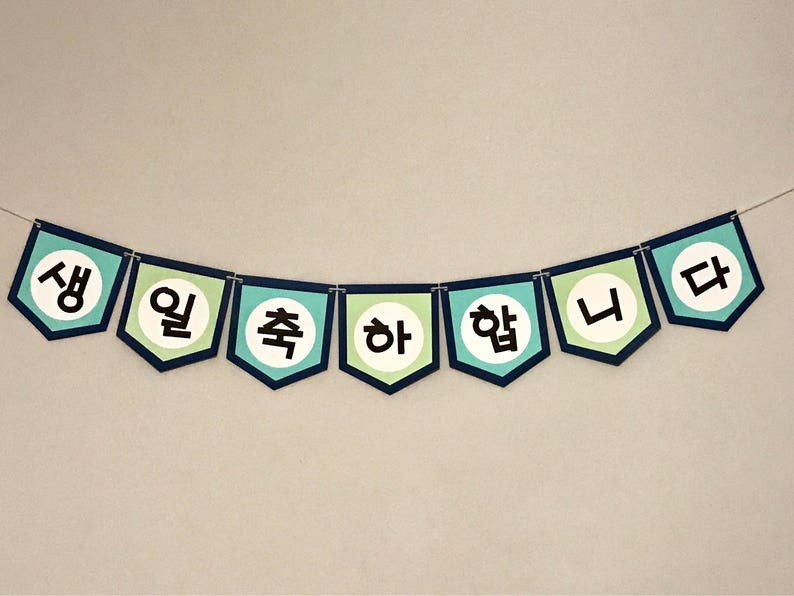 Very attentive to my questions, helped fix my Hangul, personalized the banner and cake topper that I ordered and shipping was very fast. I highly recommend working with Nativehaus. Thank you for helping make our celebration great!